AKW – the market leader in the design, manufacture and supply of inclusive kitchen and bathroom products for the elderly and disabled – is celebrating its 25th anniversary year. Working closely with occupational therapists and healthcare professionals, AKW designs and manufactures a full range of easy access showering, kitchens and mobility support products. “We are passionate about enabling people to stay in their own homes and retain their independence,” says Paul Massey, Group CEO of AKW. “The two areas of the home that pose the greatest challenges to anyone requiring mobility support are the bathroom and the kitchen. Our emphasis is delivering solutions that really make a difference to a person’s day-to-day life that are design-led and on-trend, when I joined the company I shifted our focus away from institutional looking products ensuring our products satisfy both the practical and aspirational demands of our customers, right from the very first design to fitting the living solution in the home. The need to be able to customise a living space to an individual user’s needs has been the guiding principle behind the development of AKW’s new Liberty kitchen range. Aesthetically, it has been designed to compete with the best of high street kitchens with a contemporary look, and is available in a wide range of unit sizes, worktop styles and finishes. Ease of use for all users is made possible with innovations such as the ActivMotion rise-and-fall unit, which means that work surfaces that incorporate a hob or sink can be easily adjusted to the user’s individual height requirements. AKW commands in excess of 50 per cent of the market share in the public sector and over 20 per cent in the retirement and care home sector. Additionally, AKW’s medicare expertise and experience as a market leader in creating inclusive wetrooms has seen the company now enter the retail and private sector. AKW’s reputation for delivering high-quality and aspirational bathroom designs is already well-established. 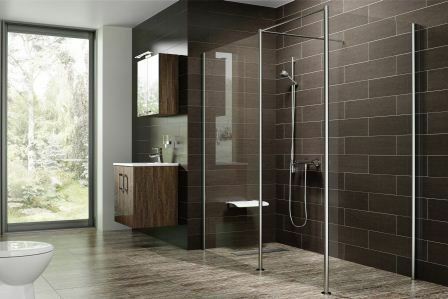 From its award-winning electric care shower range Luda®, to its water-tight linear former TriForm®, which helps lay the foundation for a stylish wetroom design, AKW’s extensive portfolio for the bathroom is unrivaled. “Not only are we a UK business but we also have a foothold in the USA and selected parts of Europe, specifically France where we grew our business by 40 per cent in 2012. Similarly, in the USA we grew our business by 31 per cent.